The following article is devoted to lovers of independent travelling, beautiful views and mobility. Bike rental is the second thing that is interesting to keen travelers after mobile phone services. If you have been to Thailand or Indonesia then you must have an idea how much more comfortable your visit is going to be if you rent a mean of transportation for yourself. As renting a car is more complicated and more expensive, rent a scooter becomes an optimum solution. So let’s examine the possibilities of rent a moped so that you could get to the shopping centers of Nha Trang, markets, beaches and the nearest surroundings on your own. That is, where, how and how much? It may seem that the choice isn’t big but it’s not so. You can hardly walk around any (especially central) street without noticing a dozen rental places where you’ll be gladly helped to hire a scooter. If you are staying at a small hotel you’ll probably be told about such nearest places at the reception. They even can bring you a bike or something to the hotel as hotel owners often have contracts with the owners of motor transport. If they don’t provide such a service, it’s enough to walk along the second and the third lines of Nha Trang (the first line where big hotels are situated is near the sea). 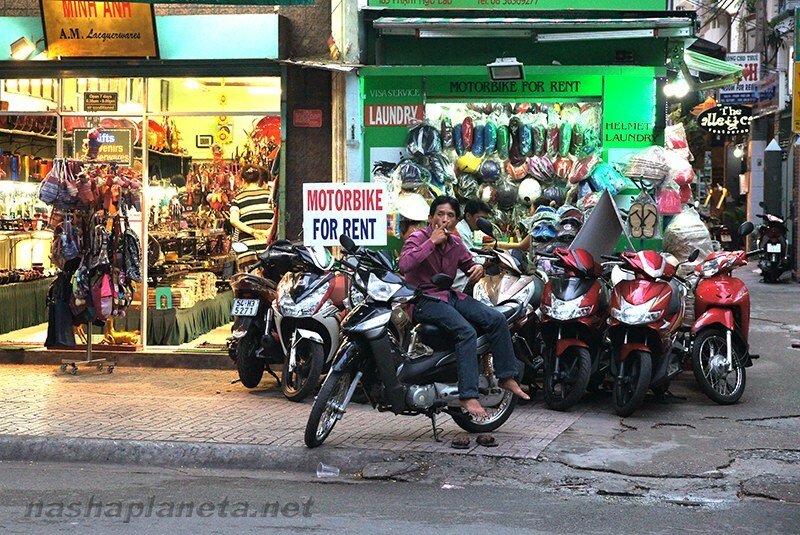 During our long stay in Vietnam, we had to hire motorbikes for our friends and acquaintances and every time we received good, reliable, and inexpensive service there. One more method of hiring motor transport in Nha Trang is getting in touch with the foreigners living there a long time and running some bike rental business. We’d advise you to turn to our good acquaintances – guys from the Moto Vietnam and they not only will help you to choose a good and suitable bike but will also give you some recommendations and several bike riding lessons. If you rent a mean of transportation you have to leave some document as a deposit. It can be your passport or driving license. Instead of a document, you can leave a money deposit. The amount will depend on the price of a bike. 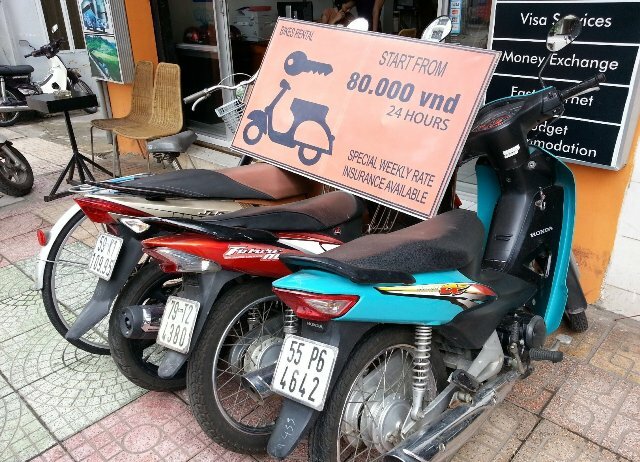 The price of a motorbike in Nha Trang starts from 80,000 dongs for a day and night. If you are in Nha Trang for a long time you can hire a bike for a month and then the price will be lower. Honda PCX ~ 250,000 VND a day. Comparatively new scooters have not yet been beat-up by careless renters, they are more comfortable and are less prone to sudden breaking down at some distant from the rental point place. Usually, motorbikes are fueled with regular 92 petrol with the price of 14,000 – 15,000 dongs ($0.5) per liter. Refueling stations are rather frequent and sometimes you even can see petrol in plastic bottles sold in the street. You can pay a fixed price or say “full” and pay for the whole tank. Be attentive! Sometimes unscrupulous Vietnamese try to cheat tourists and don’t reset the fuel counter thus making the fuel filling price much higher. That’s why you should closely watch the counter on the filling column – the digits must be close to your expectations. An ordinary bike kind of Yamaha Nuovo 4 can be filled with about 3 – 3.5 liter of petrol. Before you rent a bike you should record all defects and photo them. Inner faults should be detected by a test drive. Ignoring this point may lead to a damage compensation claim or even to a serious road accident. You certainly should also take some contact information of the rental point, their visit card, and the payment receipt. All of them may be needed in some unexpected situations. Many sources say that only the local driving licenses are valid in Vietnam. In fact, in 2014 the country signed the Vienna road traffic convention that allows owners of international driving licenses to drive means of transport on the territory of Vietnam. If you don’t have such a license and get involved in a traffic accident, you’ll be found guilty as driving without a proper document. If you have the “A” category in your driving license it’ll make an imposition of a fine less likely. But if you are stopped without a driving license about you, you could try to buy yourself off by offering the largest Vietnamese banknote. Ride your bike or scooter without a special helmet. They are required for both a driver and a passenger, but the absence of such a helmet on a passenger’s head may be forgiven. Commit a serious violation of the driving regulations, speeding (maximum speed within the town borders is 40 km/h), and if you don’t look sober. The editor’s note: it’s vitally important to wear helmets while riding a bike. An absence of helmets will be the first thing to draw the attention of the traffic police. 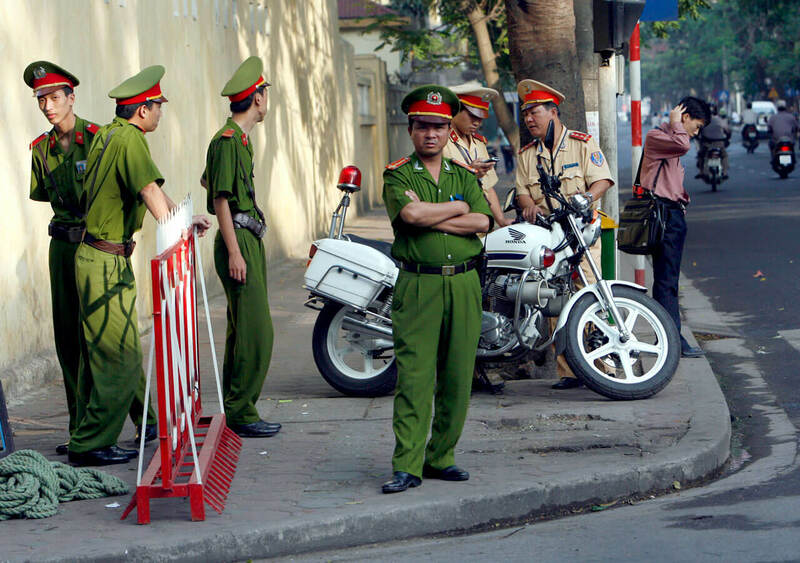 For insignificant violations that haven’t led to serious consequences, you may be punished with a fine from 60,000 to 100,000 VND (~ from $2.5 to $4). 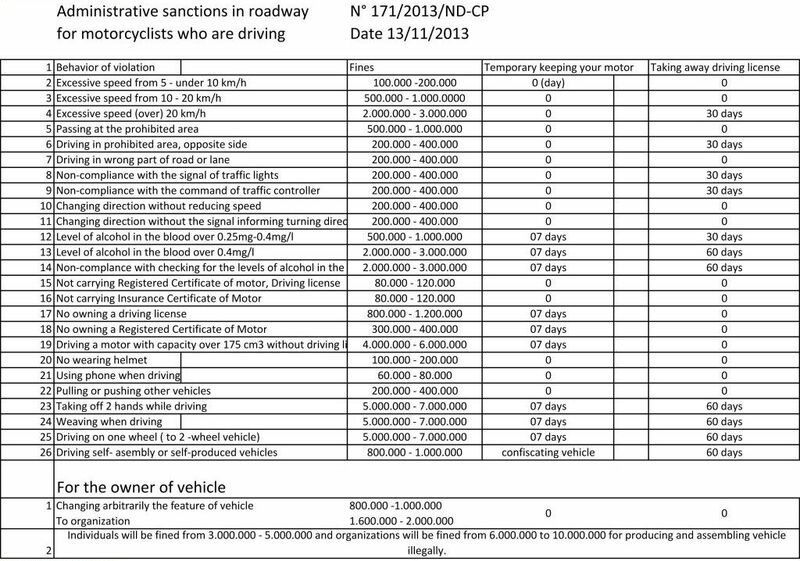 Driving without a helmet or a ride with two passengers and also some other relatively insignificant violations – from 100,000 to 400,000 dongs (from $4 to $18). Significant violations of the traffic regulations may cost you from 500,000 to 3,000,000 dongs ($20 — $130), and it’s very likely that the bike will be confiscated. First, be extremely careful while driving in Vietnam streets. Traffic here is absolutely different from what we are used to in Western coutries. Sometimes you have a feeling that there are no rules at all. You’ll easily see a biker crossing a road (4 lanes) diagonally just because it’s more convenient for him. Secondly, always wear a helmet. Try to get one of the closed type from the owners of the renal service you use. It’s a good precautionary measure that will help you to avoid an unnecessary risk and surely save you from being fined. Honestly, we’ve lived in Vietnam for a year and a half and have seen the traffic police just a few times. Thirdly, be especially attentive on Friday and Saturday nights. After a hard working week, Vietnamese often drink alcohol and drive without feeling bad about it. They even can drive without any lights on and move on the opposite direction lane. If your bike breaks down on the way, don’t ever panic. You can always use your phone and tell the owner of your bike or scooter about what has happened. The good thing also is the fact that almost on every corner there’s a workshop where you can repair a wheel if it is punctured. If you don’t see such a service, it’s enough just to show some passers-by on your broken bike and they’ll gladly tell you the way. It can be harder if your bike breaks down later than 6 – 7 o’clock in the evening. Almost nobody works after this time and Vietnamese close their cafes and start to have their evening meal. Finding an open workshop won’t be an easy task. So, try to take newer mopeds (they don’t break down as often as the old ones) and check their technical conditions before your trip. 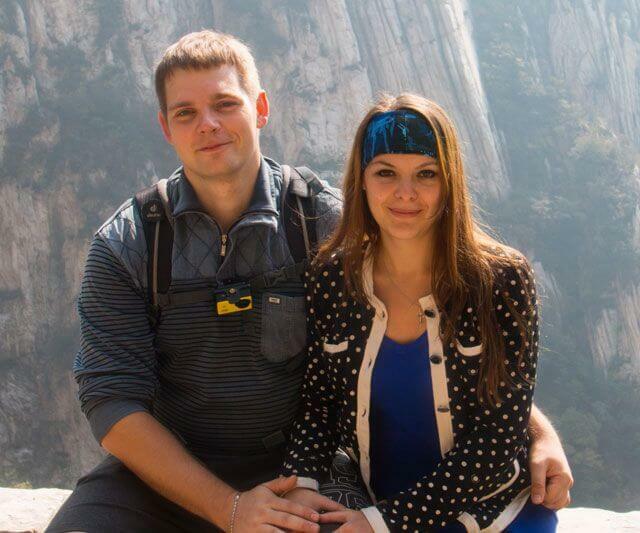 Try to get in touch with the guys from «Moto Vietnam» or check Facebook Nha Trang groups. For a small reward, the members of the community will repair your bike or at least help to push it to some proper place. In conclusion, I’d like to say that there’s nothing fearful in driving on the streets of Nha Trang. We know lots of girls who started to ride bikes from scratch and are very good at riding them now. And you will be!